so we had mushroom, onion and cheese sandwiches - on the home made bread, with a home grown salad on the side. Roughing it! So on to wood work! From that big madrone tree I took down a while back, we've milled up some thick planks for stair runners... well, really stair 'toppers' as we already have the stone step in place, but the finished floor will be about 2 inches higher than the stones are now.. thus, we want an edge of wood to define where the stair is. these boards will be flush with the floor surface behind them. First thing to do is get them smooth. I really like planing. I generally use a plane that was my grandfather's, that was around my mother's workbench when I was growing up. I used to take the thing apart when I was a kid. In the above photo you can also see that I've built a bit of a workbench in the living room of the house. it's just extra long sawhorses with a piece of plywood screwed to them, but it's pretty solid, and it's great to have a nice work table under the roof, near the project. At the end of the board I'm planing, you might be able to make out a little 'bench dog' peg I have in there as a 'work stop' - a peg of manzanita that stops the board being worked on from sliding off the end of the bench. I love simple stuff like that. Melissa meanwhile is working on more of the soffet blockers. These are doug fir 2x8s that go between the rafters that will define the tops of the walls, within the ceiling/roof. She does all the measuring, and since we have to follow the contours of the curved walls below, there's often angle cuts that need to be made. We started using my framing cross cut saw after I sharpened it up real well, and it seems to be better than the panel saw. Melissa has even started doing the sawing, and has been making cuts for a couple days now. 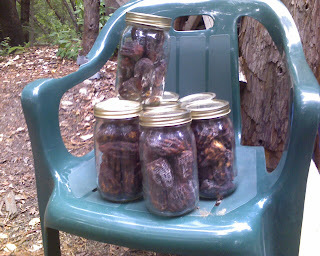 so, here's a picture of our stash of dried persimmons. They are awesome. It seems like a lot of work - and it is - for a little payoff, but since one of our closets is quite close to a skylight in the roof, we decided we'd try and get some natural light into the closet as well. That means building a 'roof' for the closet, and putting skylights in it. we have these big chunks of glass someone gave us, cut into squares (3/4" thick) so we decided two of them, countersunk into the closet ceiling would be a good way to get light in, and keep the storage capacity of the top of the closet as well. We cut the holes, and I finally got to try out my router bit that does 1/4" cuts. I'll plane this up, then put cross pieces in (that will be inside/under the 'roof') for support. Something to do while it's raining anyway. Melissa continues to fit the slate pieces in for the window sill around the kitchen. Looks good in the afternoon sun, no? The wall is now high enough to be considered close to the ceiling. I want to have the cob walls do some of the load bearing of the roof system, and so I've come up with the idea of having wedges made of 4x4s jammed in now, when there's about a foot of space left. We'll then cob them right in. In this photo, you can see that I'm using the farm jack to lift the rafter up about a quarter inch, and then I stick the wedge in, and lower the jack. Seems like a nice easy way to have the roof extra supported - even though it already supports itself. Rained all day yesterday, so instead of cobbing (Melissa wanted to catch up on some mending projects) so I decided it would be a good day to try and get rid of some of the brush downhill from our living space. I'm actually in this photo, taken at about 4pm. I'm standing behind the fire, the flames of which were actually about 5 feet tall. Melissa was standing next to our bathhouse looking north when she took this. Since the walls going up another 2 inches isn't really news, I thought I'd take some pictures of some of the other side projects that go on while we're moving mud. We decided to put in some little windows in the wall that will be between the liquor cabinet counter and the bathroom. This first one is probably 7 feet off the floor, but I'm hoping that in the summertime, bits of sunset light will come through the bathroom windows and also through this little piece. In the second bedroom, we're doing a bit of 'flair' with clear wine bottles above the shelves. They face north, so it's not like tons of light will pour through, but in an attempt to work with a repeating pattern of an arch, we thought we'd put in these. There will be one more verticle one in the center. Sort of interesting to see how it goes in though. Did a big glue up of some boards that will end up being the second bedroom closet ceiling. Notice the holes; there will be thick glass in them (actually I'll cut them bigger) so that in effect, we'll have little skylights in the closet ceiling... since the closet is quite close to the actual skylight in the roof. It's an attempt to have natural light going into the closet. Might not be that important, but thought we'd try. we have the glass. Speaking of glass, here's the start of the arched windows going in the main bedroom. They're actually just two pieces of glass, but we'll have four windows. As we cob around the walls, I add a bit to each column. The arches should be able to support the weight of the walls above the glass. Melissa has begun organizing the window sill material. We're going to use slate pieces, set in like tiles under all the windows. The glass of the windows will actually sit on top of these pieces of slate, so in the off chance that water actually makes it under the eaves, it can easily slide down the sill and avoid the cob walls. There's a lot of planning work involved, as Melissa wants to have it be a continuous line, which means turning square slate into angled pieces to go around the curves. I forgot to mention that I did all the soffet holes by hand, as it was a more careful way to push through the opposite side... the power drill chews up one side when it comes out. I really like my auger bits I got at the second hand store - and of course, sharpened up myself.